Daniela joined the HOC team in 2002 after she graduated from the 5 year full-time double degree course at RMIT University. Daniela grew up in the northern suburbs and went to high school at the Academy of Mary Immaculate in Fitzroy. Daniela speaks fluent Italian, coming from an Italian background and having studied it in high school. She studied one year of Human Biology at RMIT before transferring into the Osteopathic course. It was during her first year studying Human Biology, that Daniela began to learn about the anatomy and physiology of the human body and developed the inspiration to get involved in a career in manual medicine. During her university years Daniela developed an interest in children’s health and osteopathic treatment during pregnancy. She has since undertaken further studies in the fields of cranial osteopathy, paediatrics, obstetrics and gynaecology. She maintains an interest in women’s health, particularly treating pregnant women. Through her heightened interest in children’s health, Daniela has focused her attention on learning as much about treating children, as an Osteopath as possible. Common conditions that affect infants and children include asthma, recurrent ear infections, scoliosis, or even “growing pains”. Often newborns are brought in for an assessment after a traumatic or difficult birth for a check-up. Osteopathic treatment to the young can be very rewarding as problems may be prevented from developing into chronic conditions in later years The holistic approach allows the body’s inherent self-healing mechanisms to assist the natural healing process. In 2011, Daniela completed a Graduate Certificate in Neonatal and Infant Paediatric Manual Therapy at Victoria University in Melbourne, furthering her knowledge in this area. Daniela has treated many children and enjoys the interaction with children as much as she enjoys seeing positive results. Osteopathic techniques during pregnancy are carefully selected so that they are gentle, yet effective for the mother. Common complaints associated with pregnancy include lower back pain, leg pain, and neck or shoulder pain. As a pregnancy progresses the extra weight can cause a shift in the body’s centre of gravity causing tight muscles leading to aches and fatigue. Daniela takes great care in assuring that the mother is comfortable and relaxed during the treatment so that she can give her patient the best care possible and achieves optimum results. Daniela has held an assistant teaching position at the RMIT Bundoora campus, teaching the Osteopathic students. She has also served three years as a member on the Victorian State Council branch of the Australian Osteopathic Association. This role included two years as Continuing Professional Development Coordinator, which involved organising information seminars for Osteopaths to further their education in various fields. For several years, her role on State Council also led her to organise a stand at the annual Melbourne Pregnancy, Babies and Children Expo where Osteopathy is promoted to the public. Daniela’s newest role is that of a mother and with the knowledge that comes through experience she continues to contribute to promoting Osteopathy and its benefits for pregnant women and children of all ages. Daniela is very pleased to be part of The Osteopaths team, offering Osteopathic care to the whole family in a relaxed and caring environment. 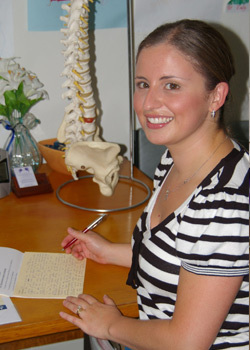 Please feel free to call Daniela to discuss whether Osteopathy may be beneficial to you, your family or friends.